From desolate and windswept to charmingly restored - the Central California lighthouses are an interesting and fun visit. 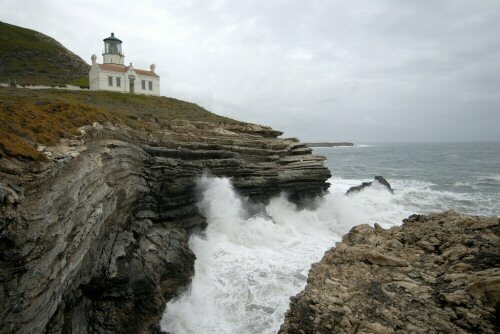 The six California lighthouses along the nearly 250 miles of Central California coastline were built to guide shipping through treacherous and rocky waters. Most of these lighthouses were built in the nineteenth century, and what remains of them give us interesting insights into how life was lived back then. Beyond this, there is a sense of mystery and intrigue about lighthouses. Four of these six lighthouses are mostly or completely restored and are open for tours. 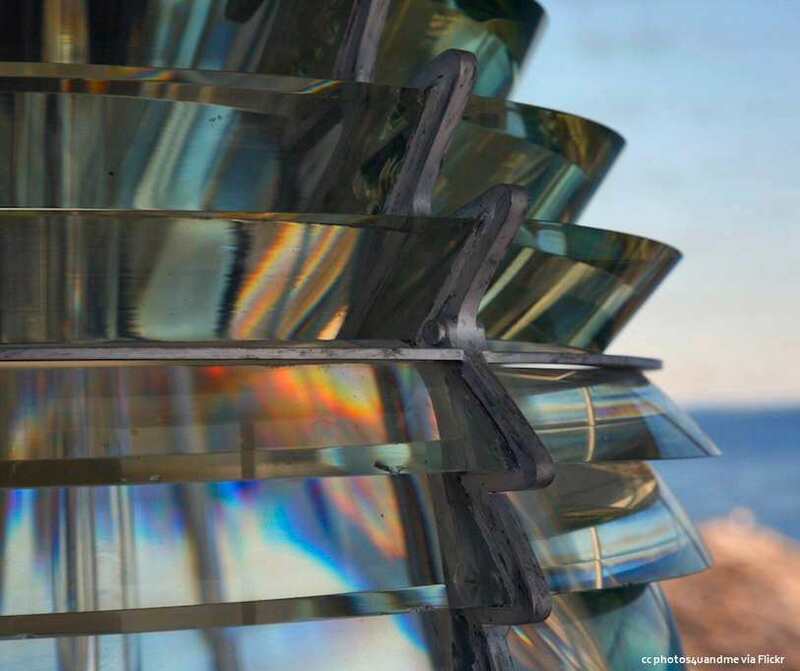 Some of the fresnel lenses that focused the light are on display either at the lighthouses themselves or at nearby locations. There are also special tours available and the individual pages on each lighthouse will have this information. By all the accounts that we have from light keepers, it was a difficult life. A life that demanded the highest attention in the worst weather. Some keepers reported having to stay awake for several days to tend the light and fog horn. The lighthouses along the Big Sur Coast were very isolated and difficult to get to, even after the completion of Highway 1 in 1937. This sort of life might seem romantic to us now, but the keepers of those days tended to see it much different then. Those who were not disposed to the profession quickly left. Many others thrived and loved the life. One of these latter was Emily Fish, a female light keeper at Point Pinos, near Monterey, who was known as the "Socialite Keeper". She took over the keepers job after her husband died. One of the highlights of visiting a light station is getting to see the beautiful Fresnel lens. These are marvels of nineteenth century technology and the story behind their invention and creation is fascinating. I just finished reading a wonderful book that tells the story of Augustin Fresnel and how his lens changed the lighthouse throughout the world. I highly recommend A Short Bright Flash if you are interested in lighthouses, how they came to be and how they changed the history of the world. The lighthouse at Point Conception, sadly not open for visits. The Point Pinos lighthouse, Point Sur lighthouse, Piedras Blancas lighthouse and Point San Luis lighthouse are open for visits (see individual pages for full information). 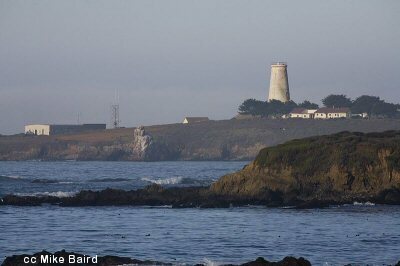 The original Point Arguello lighthouse was replaced by a utilitarian steel structure and is located on Vandenberg Air Force Base and is not open for visits. Neither is the Point Conception lighthouse open to the public as it is located on a large private ranch at the westernmost end of Santa Barbara County. 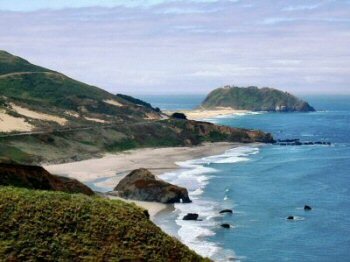 The outcrop of Point Sur - known as a "tombolo"
However, the Point Arguello lighthouse can be seen from the Amtrak trains that pass through this area. The rail line diverges from Highway 101 at Gaviota (heading north) to avoid a steep climb over the mountains. The Point Conception lighthouse is located on a mesa close to the ocean and is not able to be seen from the train, but only by air or by sea. 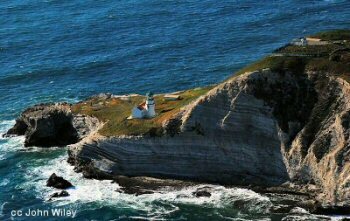 While I am especially fond of Central California and our lighthouses, there are many other interesting lightstations throughout the country. Some of the North Carolina lighthouses are quite unique and iconic. A visit to this North Carolina lighthouses page is in order if you wish to learn more. One final note: some maps (including National Geographic) show the presence of a lighthouse on Cape San Martin, between Piedras Blancas and Point Sur. I have checked on this and there is no light there now, nor are there any records indicating a lighthouse there in the past.